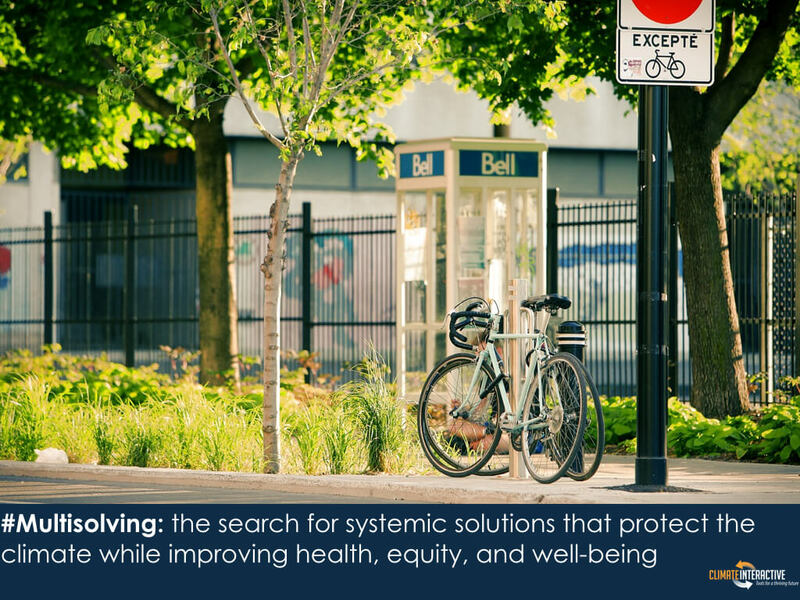 Join us on October 1st at 11 AM EDT for a free webinar introducing tools for finding and implementing solutions to climate change that also produce gains in health, equity, jobs, security and well-being. Addressing climate change could be, and we believe it SHOULD be, about more than tons of greenhouse gases. It should be about the safety and health of people and communities, and it should be about justice and fairness. The more we incorporate policies that deliver these results, the easier it will be to mobilize the resources needed to make strong and rapid progress on climate change. On Oct 1st, Climate Interactive will be launching our new Multisolving project, and releasing a set of tools for Multisolving. As part of that release we are offering an introductory webinar to explore the topic and provide an overview of the new tools. Co-Director Beth Sawin will share examples of Multisolving, make the case for why Multisolving is an important leverage point for making progress on climate change, and share tools for Multisolving that you can apply in your own work, including policy, education, and outreach resources. Register now for the webinar and please explore the new Multisolving resources on October 1!